Looking for the perfect gift for the horse lover in your life? Whether they are just a fan, leisure rider, or an avid equestrian there are many wonderful gifts that will put a smile on their face. There are many unique gifts that capture the fun and beauty of horses from jewelry to home décor. 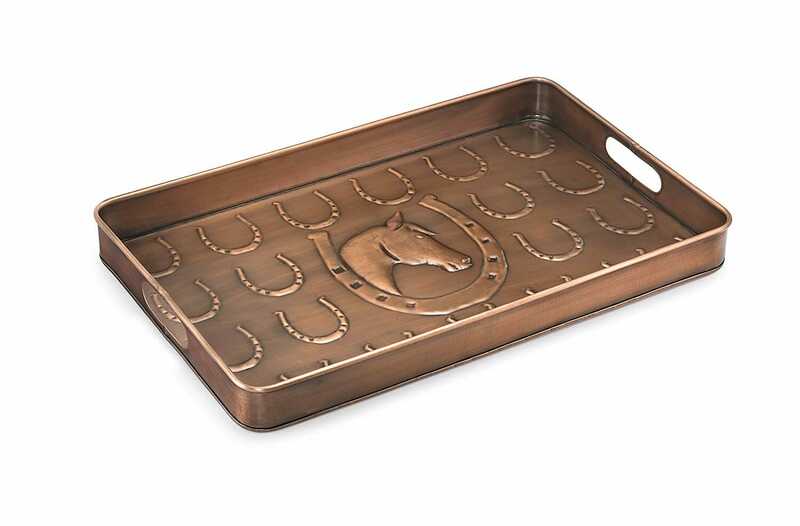 Here are some awesome gifts for horse lovers. As a good assistant, the dinosaur-shaped note box can help us record anything important at any time, so that we can’t miss it anyhow. 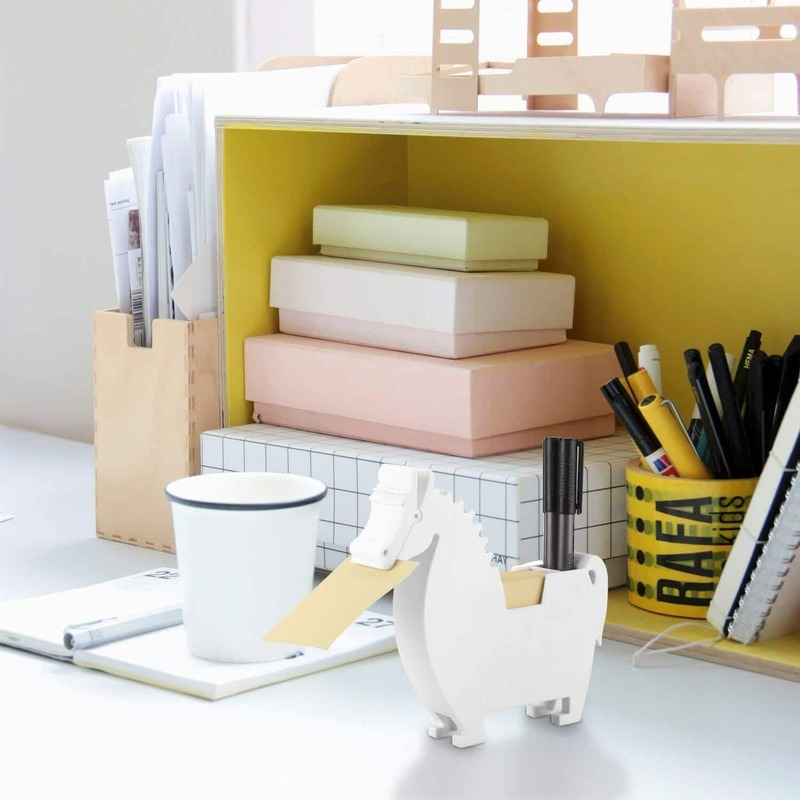 At the same time, it is also a fashionable animal-shaped pen box, able to accommodate your pens, clips, erasers and other small things, so that your desktop could be kept cleaner. Besides, it is also an interesting desktop ornament. 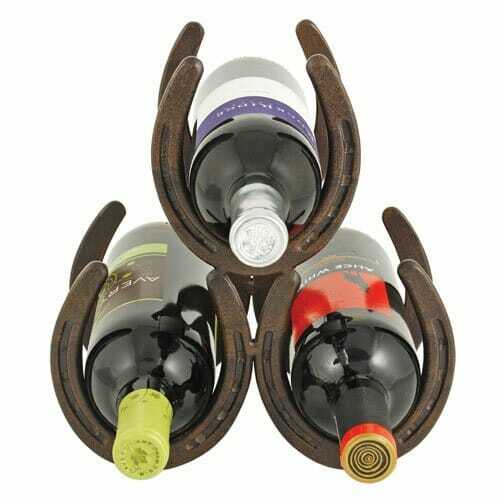 This elegant wine holder is perfectly crafted wrought iron made from cast iron horseshoes will to complete any horse lovers living room, kitchen or outdoor entertaining area. The rustic rack has clean, elegant lines that complement any decor and a compact size that’s perfect for small spaces or counter tops. Hell, you can even keep it in the stable. This high quality canvas tote bag is both stylish and unique. 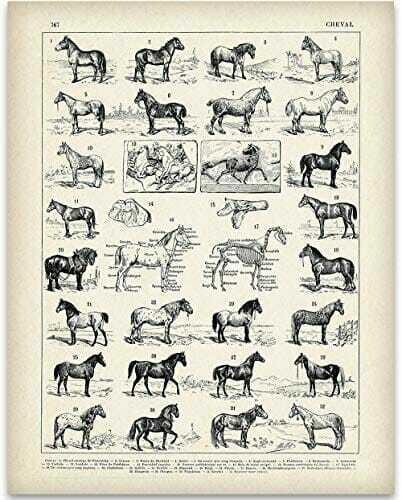 Beautiful stallion horses print with fine craftsmanship, always in style. Soft inner fabric. Top zip closure. Interior wall zip pockets. Fabric lining. Lightweight, roomy and functional, great for everyday use. Casual luxury at its best. 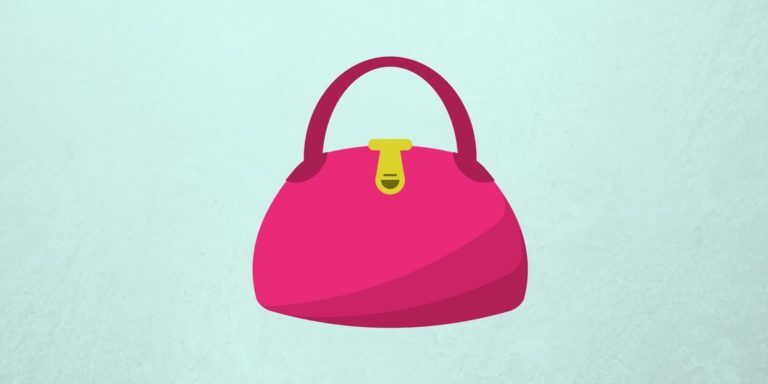 A must have for all handbag lovers. TrendsBlue is a registered trademark. 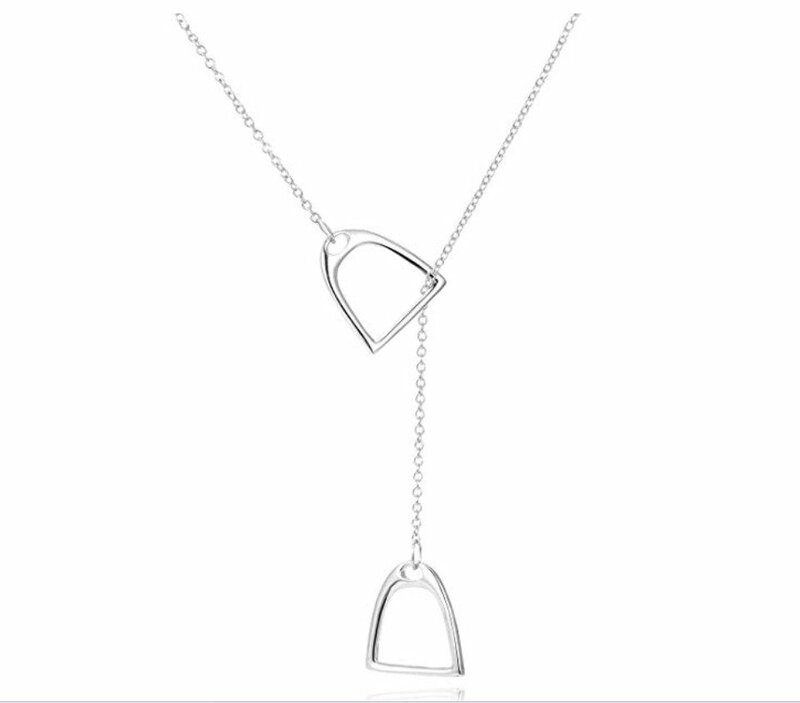 Horseshoe pendants have always been a symbol of good luck. So, pass on good luck to someone you care about or someone who is in need of a little good luck. This delicate and faminite rose gold metal horseshoe bangle bracelet will be a perfect touch to their outfit and perfect for any occasion, casual to formal. Goes well with riding boots. Handmade Horseshoe boot rack. Keep your boots off the ground in a tighty, rustic manner. This rack holds 1, 2, 3, or 4 pairs boots, made with brand-new, genuine horseshoes. Add this piece to your home or bunkhouse for an authentic “western” touch. Having your boots off the ground also keeps critters out of them and also makes for an easy clean. Simply move the whole rack, sweep, and slide the rack back without fumbling through your boots to clean the area. 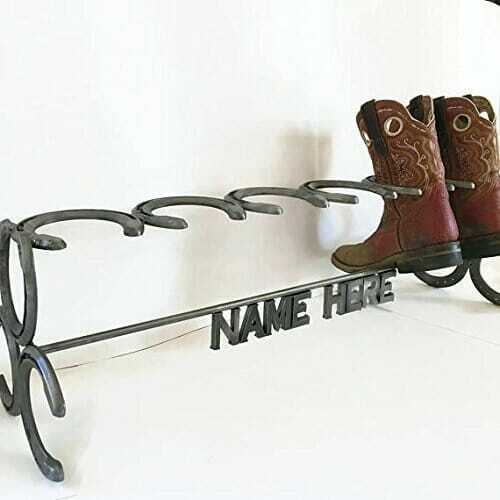 Create a boot rack with a custom name or phrase of your choosing. Bring an artistic twist to any household. 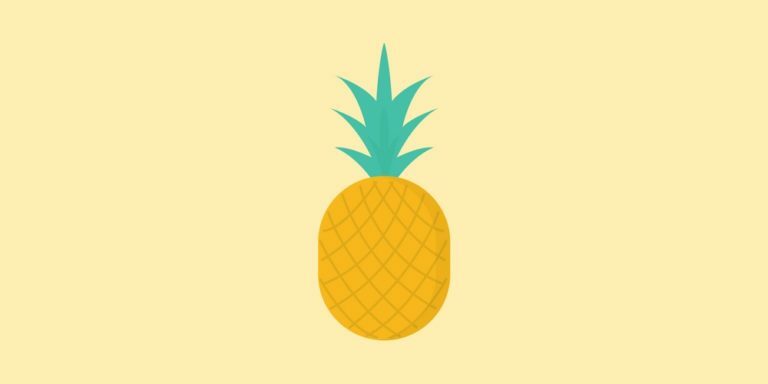 This is a real photographic print, not a cheap inkjet print like some others, and is sure to class up your home decor. The original artwork has been reimagined by award winning artist Norm Lanier. Adding a sense of timeless adventure and legendary style is a job well done by this magnificent door knocker. Standout style is all in the details; taking door hardware elements from everyday to elevated. Solid throughout, the heavyweight cast brass door knocker not only gives a good knock; it says something about the people on the other side – a reflection of their taste! Your guests would love to announce their presence with this knockout knocker. Delicate sterling silver double stirrup necklace. It is really one of a kind and the perfect gift for any horse lover. The chain is a lariat style and the Stirrups can be worn at different lengths. Gorgeous for everyday wear and special occasions. Time to display things like the true equestrian with wood stirrup shelves. These chic shelves would make a great gift for any horse lover. Set of two (small and large) included. A game that actually encourages horseplay! 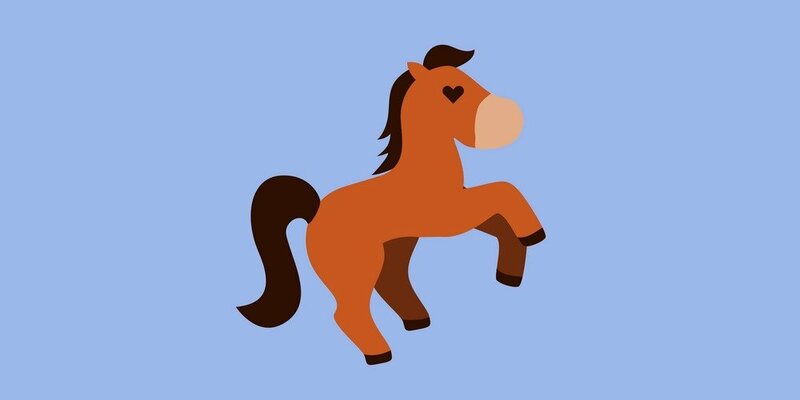 Horseplay is a property trading game based on our equine friends. 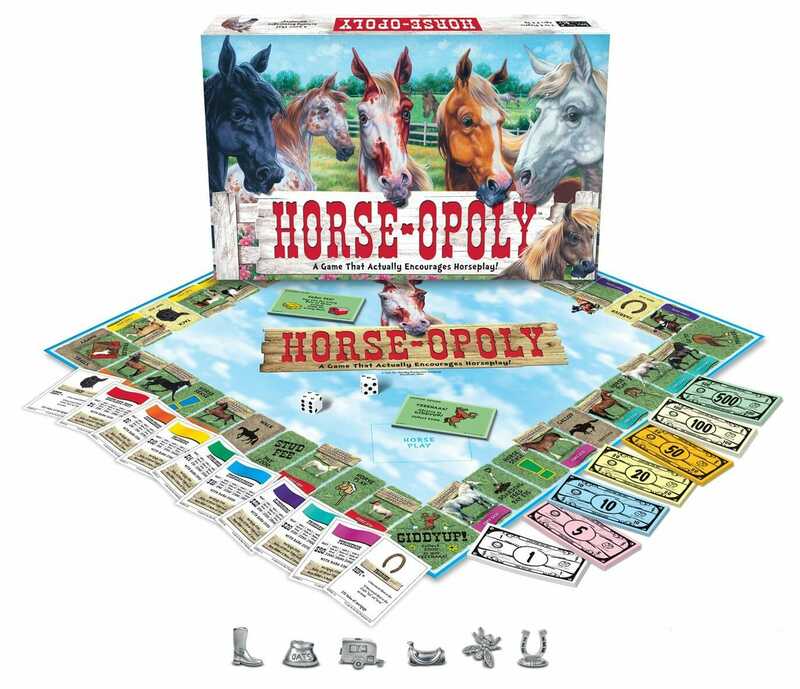 It has all the action of the traditional property trading game…with some galloping good fun. Players can choose to be a bail of hay, saddle, horseshoe, horse trailer, a bag of oats, or a boot! They buy and sell while trying to become the richest player in the game. So hop in the saddle and take this game for a ride. If you are trying to purchase a cross body cell phone bag, a mini crossbody wallet purse, a mini crossbody purse for cell phone, a wallet with a phone case for women or even a small travel wallet purse that can hold your passport or iPhone or Samsung look no further. Adjustable Strap – turn the bag into a purse, a crossbody bag, or even a purse wallet phone case! Top zipper closure. Patterned fabric inside lining. Keep the open end of your horseshoe pointed up to catch good luck and keep it from running out. The belief of this is that the luck inside the horseshoe will spill or will be lost if pointed downward. So, kind of weird but definitely a funny gift for any horse lover. These unique funny socks a\re durable, comfortable fun socks are sure to be a hit, whether you’re buying it as a gift for somebody special or wearing it yourself. The print shows the front and back side of their favorite furry animal. This cast iron horseshoe wreath would look great in your home year round. Hang it up in your barn, farm home, front door or wall. Weave fabric through it to match the season. Simple but perfect home decor for any horse lover. This cute soft leather and lightweight suitable for ladies and girls, easy to care. Both side digital print design, stylish, beautiful, can use as evening party bag or daily purse wallet. Super large pocket for passport, keys, cash, coin, checkbook, and phone and a zipper pocket is convenience to storage your coins and prevent it falling out of your bag. Snuggle up in this sophisticated rustic home accent blanket. Nothing compares to the comfort of being wrapped in Carstens cozy sherpa lining. The Plush fabric used in Cartens throw blankets is not only incredibly soft, but vibrant in color and easy to care for. If you’re looking to buy the perfect personalized gift for horse lovers, then search no further! We created SaddleBox to help foster that special bond between horses and their owners. 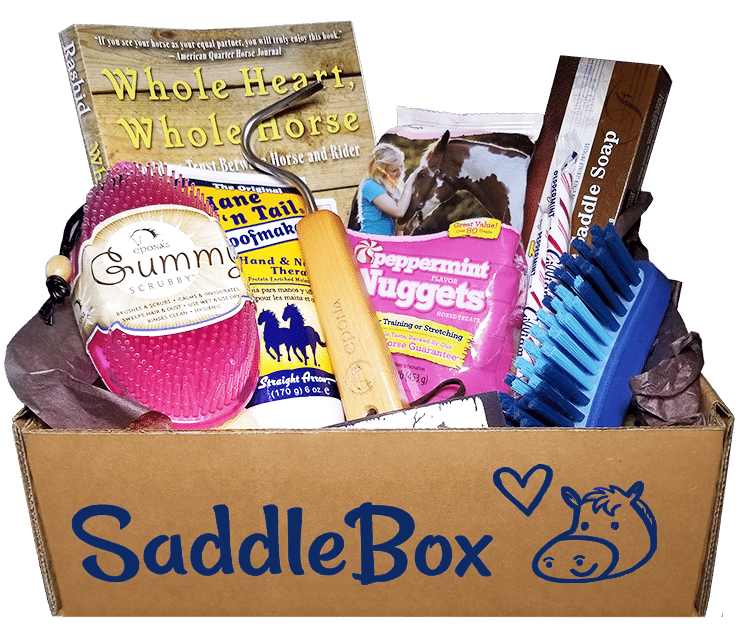 Every monthly SaddleBox includes items that help riders become closer with their horses, such as treats, grooming products, western gear and more. 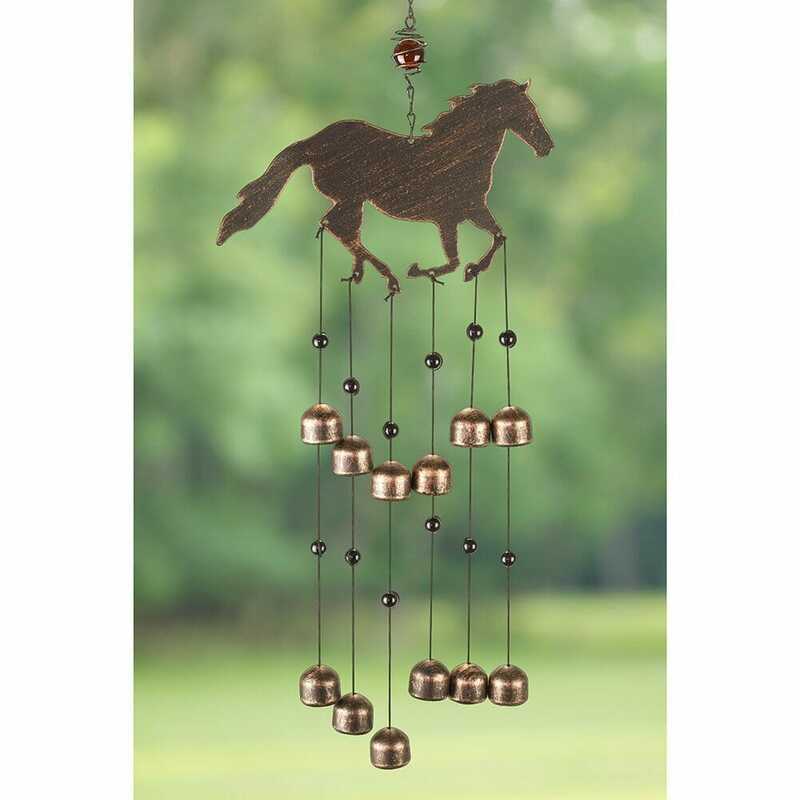 They can enjoy the soft relaxing tones of these harmonic wind chimes. Hangs beautifully in a garden, home, patio, office or near the stable. Excellent design and quality craftsmanship made of iron.